I have just had the strangest treat ever, courtesy of a little place called Trader Joes. It's funny because I've known about Trader Joe's for...well, forever now, yet I never actually went into one until today. We had found a nice assortment of all natural snacks at Whole Foods, some good, some not so good, but Whole Foods is just so far away. Trader Joe's on the other hand is a place I can hit at lunchtime, and if the assortment of snacks I bought is as tasty (and junk free) as it looks, then I will definitely be heading back soon enough. Ok, so I'm making my way through the aisles to see if there is anything worthy of my attention. I really just want snacks, but I'm finding everything but snacks, which seemed silly considering the fact that the store really wasn't that big. The snacks you see, are hiding above the freezer section in this particular Trader Joes. Mmmmm, freezer section ...I wonder if they have .....OOOOOOO, nice! those ice cream cookie sandwiches look fantastic. Cool, all natural super premium ice cream too! Soy ice cream? yeah, I'm ok without that...but wait, what's that hiding behind the Soy Ice Cream? Mochi? 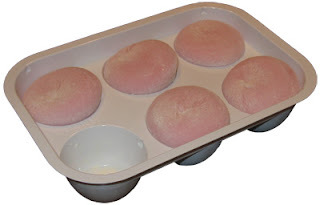 What in the Sam Hill is Mochi Ice Cream?? 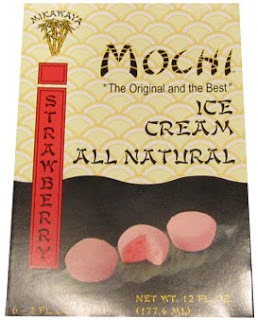 This is Mochi Ice Cream actually, all natural Strawberry flavor in particular. My choices were chocolate, green tea, mango, and strawberry. The first thing I noticed was that only some flavors are all natural, some resort to artificial flavor. Wait, that's not true - the first thing I noticed was a box labeled ice cream that showed little ice cream balls on it. "The Original and The Best". The original what, I do not know, but how could I possibly walk out of the store without these little bad boys? I grabbed a bunch of snacks, a lumpy bumpy bar, some mochi ice cream, and headed for a cash register. (as a side note, instead of a cranky Whole Foods lady cashier, I was helped by a very well mannered gentlemen who thanked me for my business). You know what's coming next right? Oh yeah, we're snacking on the way back to work! Now the box says 2 in a serving, and there are 3 servings total. Last time I checked, that makes 6 pieces, though upon opening the box, I was shocked by the size of the mochi ice cream. For some reason I visualized these little poppable treats. I just assumed they would be the same size as the picture on the box (I know, I know, I'm old enough to know better). They look like some funky little powdered cookie, not a ball of ice cream. I dig in and it's not just a ball of ice cream, it's a ball of ice cream in a funky puffy shell, really really puffy. I'm surprised that it's so soft and squishy at frozen temperatures. The only way I can describe it is that it reminds me of some kind of funky, super soft DUBBLE BUBBLE bubble gum. I know it's suppose to be Strawberry but my memories are trying to trick me into thinking it's bubble gum. I was done in 4 bites. The coating to ice cream ratio felt like it was 1:1, but as you can see from the picture, it's not quite that high. If you are a regular reader, you know I usually like my ice cream flavor to outweigh my coating flavor. If I was in charge, I would definitely make a thinner coating. Speaking of coating, let's get some more info: The coating, or mochi, is actually a Japanese rice cake made of a sticky rice paste. Sure I could have read the box to find that out beforehand, but what fun would that be? Yeah, this is one strange little treat for those of us who don't go out to eat enough. I don't want to say it's bad, it does have some positives: the ice cream inside is respectable. It has a nice strawberry odor and you can even see a few little bits of real strawberry pieces. There's also no funky chemical tastes or anything else trying to ruin this little treat, but man, this texture is really hard to get over. At $3.49 for a six pack, I guess my opinion is that you should try them so that you can say that you have tried them, but in no way am I implying that you are going to like these, let alone love them. In fact, I'm curious to see what my wife and daughter have to say when we have these for dessert after dinner. SORRY - SECOND SCOOP CANCELLED - I don't know if it was the egg whites they put in the mochi or just unfortunate timing, but these treats did not settle well. I hate to share like this, but at the same time, I'll feel guilty if I don't throw up a potential egg allergy alert here. While I picked up the mochi ice cream made by Mikawaya, Maeda-en also makes it ( subtitled as gourmet bonbons ). Both companies offer chocolate, vanilla, strawberry, mango, red bean and green tea flavors. On top of that, Mikawaya offers coffee flavor, while Maeda-en offers Lychee flavor. I just read your post about mochi ice cream and I thought it was very funny and informative, I am addicted to the red bean flavor, I bought them from an Asian grocery to "try something new" with a friend. We both ended up LOVING them and not the chocolate that we thought we would like. I ended up eating them all by the next night and had to drive back into the city to get more. Totally didn't think they would be good but it was worth the shot. Sorry to read about them not sitting well with you. Good luck with the ice cream endeavors. Mochi ice cream is DELICIOUS! I'm also sorry it didn't sit well with you. Mikawaya is "the" brand for mochi ice cream. They have a store in the Little Tokyo here in Los Angeles where they have SO MANY more flavors (but they're EXPENSIVE; $1 for ONE of those). 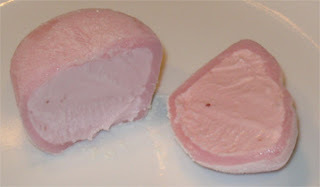 Most people associate "mochi" with "mochi ice cream" but as you mentioned, mochi is really the rice cake on the outside. They're all really good! The potato starch on the outside is annoying because it sticks to your mouth and your clothes when it falls off the mochi onto your shirt but it's soooo good. I had the Mochi Ice cream balls for the first time a couple of days ago, and I just LOVED them!!! I couldn't get enough! Sorry you didn't like them, but that leaves more for us that do.. ha..